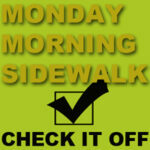 Monday Morning Sidewalk is where you week starts getting you ready for next weekend! Keep up to date on Texas Fly Fishing conditions here. Late night Wakanda fly tying. Russian food.